The pre-eminent dance anthropologist Anya Peterson Royce describes virtuosity as a submission to a particular kind of order that culminates in a sense of awakening. This awakening of course is not only for the performers, but during performance, extends to the audience members who experience the aura of virtuosity. 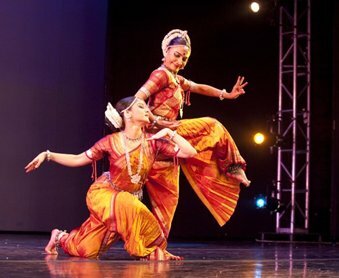 The Nrityagram dance ensemble, which performed at the Montgomery Community College in the greater Philadelphia region on March 27, 2010, exuded this sense of virtuosity. The dancers without question had completely submitted themselves (much like the bhakta or devotee) to the Odissi form. The concert was a perfect blend of nritta and nritya that showed the dynamism of Odissi through imaginative choreography. The dancing was accompanied by zero stage craft and minimal lighting. This was a welcome change from the "over-production" common in staging of dances today. The starkness accented the sheer poetry of movements, music, and costumes and created moments of stunning perfection. The dancing took me back to an idealized village India as the wellspring of creativity. Despite my personal discomfort with this notion of eternal India, I looked on with mesmerized eyes (mugdha nayan). The program notes gave the audience a brief description of Nrityagram or dance village, founded by the late Protima Gauri, where dancing, she says, is a way of life. It also noted that Nrityagram receives many artists from all over the world who give seminars and workshops on music, sculpture, painting, theater and dance. The notes mentioned Ntriyagram's rising visibility in the international circuit of dance. The choreographic composition 'Pratima: Reflection' was first commissioned by the Joyce Theater in New York. Sruti, the Indian Music and Dance Society in the Philadelphia region, in collaboration with Montgomery County Community College, was presenting this work. So, one must not be misled by the term "gram" or village. The political economy of Nrityagram is the opposite of an isolated village India; it is a narrative of globalization and networks. All members of the ensemble - Surupa Sen, Bijayini Satpathy, Pavithra Reddy, Rasmi Raj and Manasi Tripathy - are highly accomplished dancers. Their measured and eloquent movements matched the symmetry of their proportioned bodies. Surupa Sen, the artistic director and choreographer, is to be commended for creating a sustained sense of beauty through solos, duets and ensemble work, among which the choreography of 'Chhaya' was most appealing to me. The snake-like coils of the tribhangi were visually arresting as bodies united and multiplied, creating and highlighting cohesion and interdependence of images. The bols of the mridangam emphasized this collective unity of the dancers, where each individual dancer melded perpetually into the collective. A similar idea about interdependence and duality of being was rendered through the narrative piece 'Vibhakta,' performed by Surupa Sen and Bijayini Satpathy. They portrayed the duality of Ardhanareshwara with energetic articulation of raudra rasa. This was different in energy and composition to the rendition of the solo Ardhnareshwara one associates with the late Sanjukta Panigrahi. The piece 'Mugdha' was choreographed to the lyrics of Geet Govind. It was perhaps the quintessential Odissi piece in my memory; surely as a result of the popularity of the song "Dhira Samire" choreographed by the late Guru Kelucharan Mahapatra and performed by his many disciples. But in this rendition by the Nrityagram ensemble, the Odissi vocabulary seemed to expand into more spectacular leaps and movements from the more conventional undulating and statuesque postures. The slow and fast paced movements synchronized with playful eyes and expressive faces of the three dancers Pavithra Reddy, Manasi Tripathy, Rasmi Raj. Odissi dance was identified and codified in the 1950's as a classical Indian dance form from the state of Orissa. Although derived from temple sculptures and the Vaisnavite tradition, it embodies many trajectories and influences (Mahari, Gotipua, Akhada, Nacha). The powerful impact of the bhakti movement in medieval India and the dominance of Krishna cults overshadow the tribal or yogini cults that also form part of the Odissi heritage. These influences are mostly overlooked in the dominant history of the form. However, the emphasis on powerful leaps, dynamic movements, and stunning yoga postures in the repertoire of the Nrityagram ensemble reminded one about the other traces of history in this dance. The concluding piece 'Aarati' created the chariot or rath of Jagannath with dancing lights. It was a celebration of dance as worship (aradhana). In Sanskrit "Aa" signifies towards or "to" and "rati" is "right or virtue" and the piece became a fitting end to a virtuoso performance. The richness of the dance that was presented did not do justice to the reductionist history of the dance form presented in the program notes. The complex history of classical Indian dance forms is an integral part of their vitality and resonance in postcolonial India. The "awakening" Anya Peterson Royce talks about is supposed to last past the moment of its experience. For such deep and sustained awakening of knowledge or interest in Indian dance, more attention should be paid to the program notes. Art exhibitions are a good example of how such knowledge about specific art forms are produced in a nexus between the artist, the art-historian/curator and the viewer. Perhaps the dance world should follow in their steps? Pallabi Chakravorty teaches in the Department of Music and Dance at Swarthmore College. She is a Visual Anthropologist, Kathak dancer, and the founder and artistic director of Courtyard Dancers, a contemporary Indian dance ensemble based in Philadelphia. Her books include Bells of Change: Kathak Dance, Women and Modernity in India (2008), Dance Matters: Performing India (2009; co-editor and contributor), and Performing Ecstasy: Poetics and Politics of Religion in India (2009; co-editor and contributor).